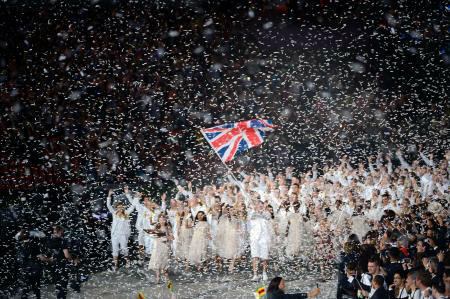 Great Britain team entering the Olympic Stadium during the Opening Ceremonies of the London Olympics. 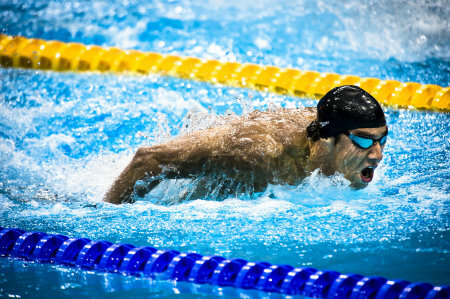 Michael Phelps in the Men's 200 Meter Butterfly Semi-Final. Gabrielle Douglas competing on the balance beam during the Gold Women's All Around Gymnastics competition, in which she took the gold medal. 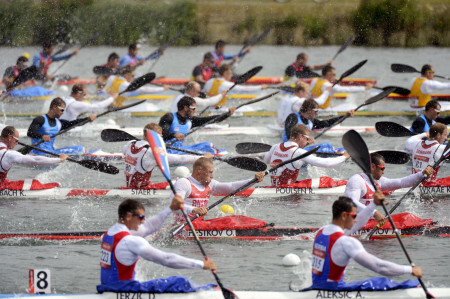 Men's Kayak 4 (K4) 1000 Meter Sprint at Eton Dorney during the London Olympics. 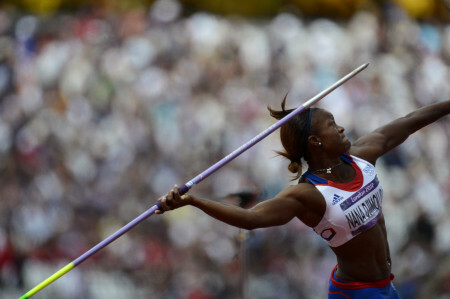 Antoinette Nana Djimou Ida of France throwing the javelin during the Heptathlon competition at the London Olympics. 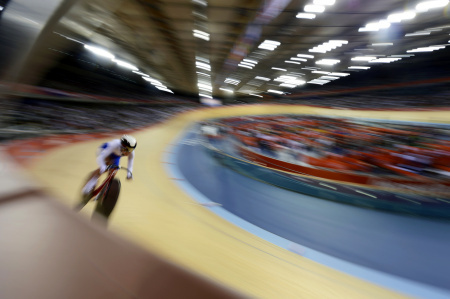 Women's Omnium at the Velodrome. 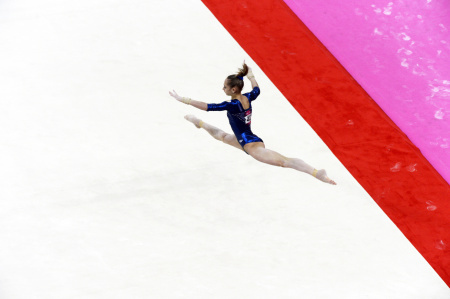 Victoria Komova of Russia performs her floor exercise during the Women's All Around Gymnastics competition, in which she won the silver medal. 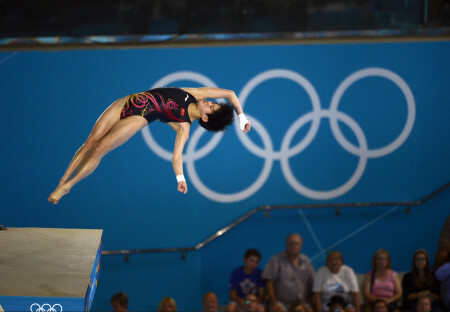 China's Chen Ruolin on her way to winning the gold medal in the women's 10 Meter Platform competition. Jessica Ennis of Great Britain after winning the gold medal in the Heptathlon during the London Olympics. 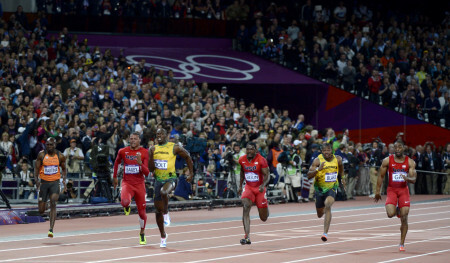 Usain Bolt of Jamaica pulls away to victory and a repeat gold medal in the Men's 100 Meter final at the 2012 London Olympics. Brazil's Juliana Silva taps the ball over the net as China's Chen Xue tries to block. 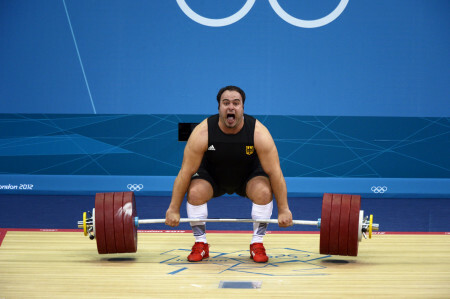 Almir Velagic of Germany attempting a lift in the Men's +105kg Weightlifting Competition. Corina Caprioriu of Romania, the eventual gold medalist, wearing blue, takes down Marti Malloy of the United States during the women's 57kg Judo competition. Malloy won the bronze medal which she shared with Automne Pavia of France. Men's Judo - 73kg. Class. Nicholas Delpopolo of the United States in white Nyam-Ochir Sainjargal of Mongolia in blue. 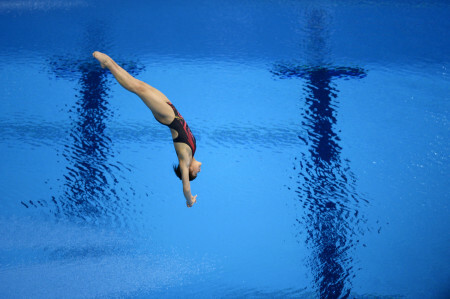 China's Hu Yadan during the Women's 10 Meter platform competition at the London Olympics. 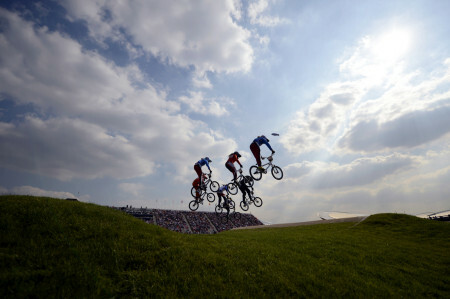 The Women's BMX finals during the London 2012 Olympics. 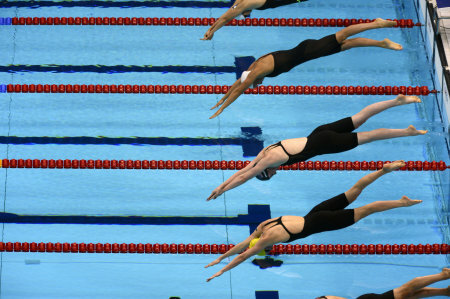 Missy Franklin of the United States, second from bottom, takes to the water at the start of the Women's 4x200 Meter Freestyle relay, in which the United States took the gold medal. 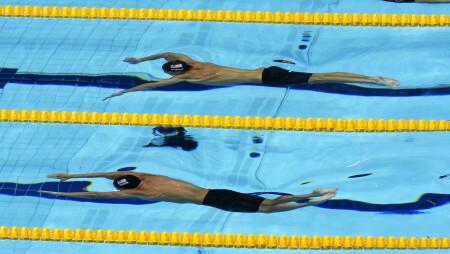 Michael Phelps and United States teammate, Ryan Lochte competing in the semifinals of the 200 meter individual medley during the 2012 London Olympics. Phelps finished first in the event to take the gold medal, while Lochte was second with the silver. Oscar Pistorius of South Africa - Men's 400 Meter Semi-Final. Serena Williams, Gold Medalist in Women's Tennis. Jessica Ennis of Great Britain preparing to throw the javelin on her way to winning the gold medal in the Heptathlon during the London Olympics. Ryan Lochte of the United States after finishing fourth in the 200 Meter Freestyle. Yannick Agnel of France took the gold medal. French swimming fan at the Aquatic Centre. Women's marathon as seen from Westminster Bridge. The Olympic flame with spectators at the Olympic Stadium in the background.